We usually do a pretty good job of getting rid of our eggs by selling them to friends. (See crack-dealer )However, occasionally we get behind and become overloaded with eggs, and I have to find easy ways to use them up. Here are my top five egg-using ideas. 1. Egg Salad – Unfortunately, not everyone loves egg salad, but Hal LOVES egg salad. My recipe is basic. Boiled eggs, mayo, salt, black pepper, and a dash or two of cayenne pepper. Of course there are lots of variations of egg salad. Some people add pickle juice (blech). Others us mustard or turmeric. That’s what great about egg salad – it can be different every time. But mine isn’t. 5. Dog Food – Don’t judge me. When we fix scrambled eggs for breakfast, it’s not really a big deal to throw in a couple extra for our little French Bull Dog, Lily. However, I’m not above scrambling a dozen or so eggs (in bacon grease) for our two Weimaraners – especially if we’ve run out of dog food. 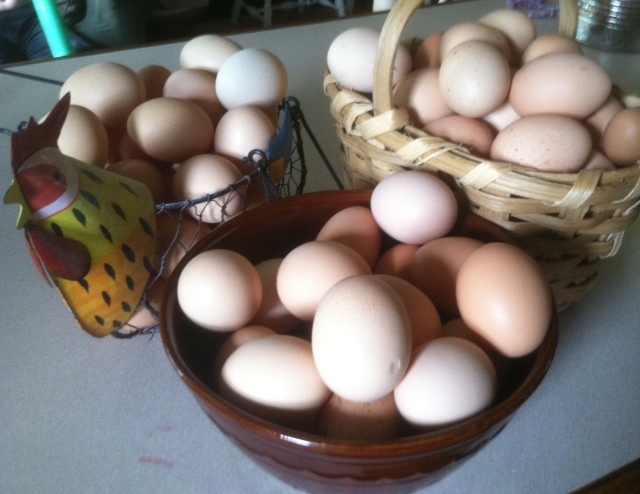 As long as we are raising chickens, I’ll be on the look out for great egg recipes – especially ones that use lots of eggs. Feel free to post yours.